Pau Gasol picked what is probably the best night ever to have a good offensive outburst, as he announced prior to the game, that he would donate $1,000 for every point he scored in last night's contest to the UNICEF disaster relief in the Philippines. Gasol ended the game with 24 points and 10 rebounds on 11-19 shooting and looked like he benefited immensely from the strange 4 days off the Lakers enjoyed the start the week. 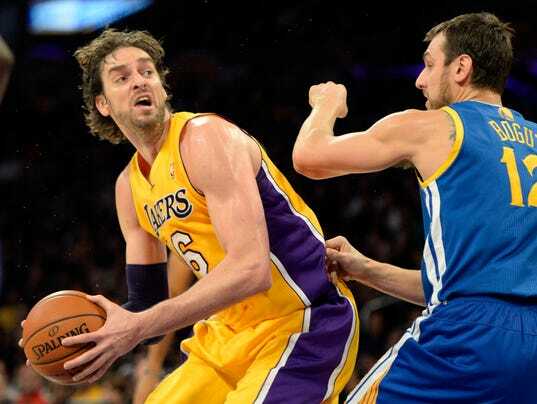 Pau looked like vintage Pau, showing off his wide offensive arsenal in the low post, and showing some flashes of an improving jump shot, as he abused David Lee on the offensive end. That's not to say Lee didn't push back, as he scored 21 of his own points and added 13 rebounds for good measure. Jordan Hill, who started the game despite no other Center being available on the bench due to Chris Kaman's injury, finished with a solid 10 points and 9 rebounds. Steve Blake continued his run of great play, scoring 14 points and dishing out 5 assists, while playing some very good defense on both Andre Iguodala and Klay Thompson; Iguodala started at point guard for the Stephen Curry-less Warriors but left the game with a hamstring injury in the 3rd quarter. Thompson scored 19 points, but shot a horrid 6-20 from the floor. Iguodala ended his night with a measly 6 points and 6 assists on 1-4. Nick Young, coming off the bench, continued his good shooting, going 7-15 from the floor and pouring on 21 points from the bench (the bench scored 44 of the Lakers' 102 points). Young has been a bit inconsistent to start the year, but has shown flashes of his scoring potential lately, and if we include tonight's performance, has averaged 17.2 points per game for the past 5 games, shooting at a high clip (49.2% or 32-65) and coming off the bench in each of those 5 games, providing a huge spark to the Lakers offense. Jordan Farmar was excellent in substitution of Blake, scoring 14 points and 8 assists. The Lakers did just about everything right on offense, moving the ball well, moving off the ball, taking open shots and generally not forcing the action; it's why they shot 47% compared to the Warriors' 41%. Defensively, Los Angeles rotated on time and helped each other. They communicated well and seem to be improving over early on in the season. The Lakers are now 6-7 as they await the return of Kobe Bryant and Steve Nash (who will be out at least 10 more days) and will face the Sacramento Kings (4-7) next at home on Sunday. It's safe to say the Lakers are keeping up with what they wanted to do to start the year, which was to keep the team close to .500 until Bryant makes his return.